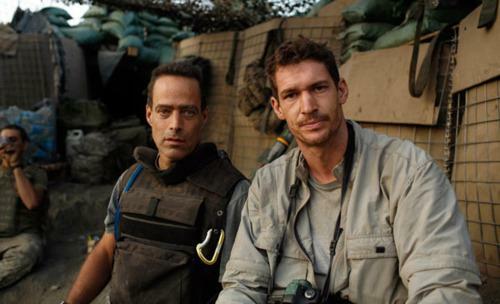 RIP: 41-year-old British-born filmmaker and photojournalist Tim Hetherington, co-director of the Oscar-nominated Afghanistan war documentary Restrepo, was killed today when an RPG struck a group of journalists in the Libyan city of Misrata. Three others were also injured in the attack: Pulitzer Prize-nominated Getty photographer Chris Hondros, Panos Agency photographer Guy Martin — both of whom are said to be in serious condition — and freelancer Michael Brown, who was slightly wounded. Its a sad and sobering story that reminds us what is happening in Libya right now. What many have been calling “half assed” warfare from NATO forces has left many Libyans and international reporters open to the indiscriminate murder that was promised by Qadaffi. My thoughts go out to Tim who was considered one of the best and bravest in his field. But the question in my mind remains the same. In an Arab world that does not want us there but also requests massive aid, how do you involve a military already spread extremely thin? This is such a bummer to hear. Tim Hetherington was a great man. Very sad to see him go. #1: US Military is thin. #2: The US isn’t NATO. It’s a part of it, but i recall around 15 other countries who are in NATO. #3: NATO has been useless since the fall of communist Russia, considering it was made to pretty much fight them. #4: Is eygpt apart of nato? Didn’t know it was. If anything UN should be … no they don’t do anything either. they only shoot when shot at. NATO is essentially the combined forces of the world, but handled by the UN. NATO has a standardized set of rules for warfare which has been agreed upon through the Geneva Convention. Any nation that participates in NATO (which is basically any nation participating in the UN) must follow these rules. The US military is part of NATO, but in order to participate in a NATO operation it must be agreed upon at a UN council meeting for which countries will proceed. Countries who have an overly exhausted military do not have to participate, however it looks poorly upon them if they decide not to help even though they can afford to send in forces. It’s basically a way of saying that they don’t agree with the UN. The US military isn’t participating heavily in Libya because we are in essence, exhausted.